We had already conquered Huayna Potosi (6088m) five days previously but we were still craving something a little more challenging and Mount Illimani (6490m) was going to be the one: its six peaks loom over La Paz dominating the landscape. Organising the climb was a major undertaking, as we didn’t book through an agency. We hired a guide privately and organized all our food, equipment and transport ourselves, but this made the trip even more exciting as it was a proper expedition. We set off from La Paz early in the morning then it was a bumpy three and half hour drive to a small village called Estancia Una. After unloading all the equipment is was a 3hr hike to the base camp where we set up the tents for the night. The setting was idyllic: we were surrounded by rolling hills, streams and hundreds of llamas and sheep. After a good nights sleep we felt rested for the day ahead which was going to be a steep 4hr trek up to High Camp. Fortunately we had organised two porters in the village to carry some of our equipment and food. I felt slightly ashamed at this point, as there was us kitted out in our expensive high tech equipment and rucksacks while the porters had rubbers sandals and a cotton sheet to carry our supplies. They even proceeded to embarrass us more by reaching high camp 1hr before we did. Feeling pretty tired from days trekking we slowly set up the tents at the high camp which was at an altitude of 5500m , then we ate a light soup that “Chef Marco” prepared for us. The entire camp was covered in a thick cloud for most of the afternoon, with only fleeting glimpses of the mighty Illimani. Just as we we’re off to bed the clouds parted and we got our first proper view of the entire mountain and the route we would be taking to the summit! At this point my nerves kicked in and the daunting task ahead slowly dawned on me. We weren’t able to enjoy the view for long as we needed to go bed even though it was only 7pm. Our guide Hugo was going to be waking us at midnight to start our ascent under the light of the moon and headlamps. The reason for starting the climb in the night is due to the snow an ice conditions being at their best. If you leave any later when the sun rises it begins to melt the snow and ice making the conditions very dangerous on the descent. After 5hrs of restless and uncomfortable sleep, due to the effects of altitude and extreme cold temperatures, the time had come! We clambered out of the tent to find perfect conditions, completely clear sky’s we even had views right to the summit and almost a full moon. There was just a blanket of clouds below us. The first part of the climb was very hard going as our bodies were slowly adjusting to the thin air, and the steep walls of ice and snow we were slowly zig-zaging up seemed endless. None of us were talking the only words we spoke were, “ STOP” or “Are you OK”. All of us were deep in concentration ensuring that each step we took was secure and that our crampons gripped the snow and ice tightly. Hugo our guide had told us the most important thing you need to do is ensure that every step you take you have a good grip in the snow. If any of us slipped or fell, we were all could be sliding down the mountain side, as we were all attached to one rope. We all needed to be ready at any time to roll on our front dig our ice axe and hold on for dear life, literally!!!! The last hour of the climb was exhilarating and exhausting at the same time. It was freezing and getting colder with every step; the temperature was probably -15 degrees C with the wind chill factor. My body felt drained of energy but I felt uplifted by the spectacular views with every step they were getting even more dramatic. The sun was beginning to rise turning the sky orange and the lights of La Paz glowed in the distance. I kept on telling myself, “Keep going you’ve come this far there is no turning back now! The last 50m to the summit were the hardest for me, I felt exhausted. We were taking such small steps that it took us half an hour to finally get there. 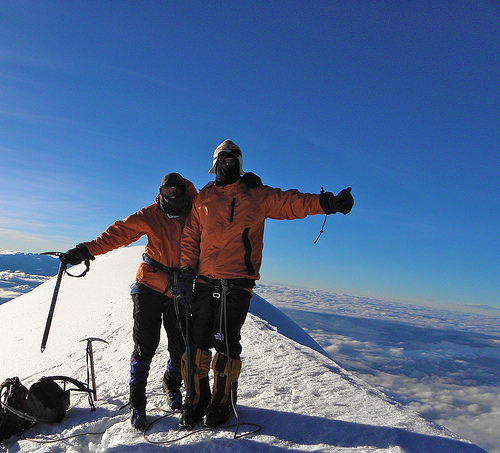 Unlike Huayna Potosi there isn’t peak as such, just a wide flat crest,which makes it hard to identify where the the summit was, Hugo reassured when we had reached it, with a big hug and congratulations! We were fatigued and over whelmed and we couldn’t quite believe we had me it. Afterwards we all just sat there taking in the spectacular views, the sky was bright blue and it really did feel like we were on top of the world. Then came photo time and we were all determined to have the evidence that we had made it to the summit. The night before we made little notes on the back chocolate bar wrappers stating the date, mountain, altitude and our names. We were all ready to hold them up proudly in front of the camera. As we got them out of our pockets Marco unexpectedly handed me a note; I turned it over and it read, “Piccola I love you! Will you marry me? Before I could say anything, he got down on one knee and asked again will you marry me? At that point I was almost crying and I don’t think I could speak, a combination of the altitude and emotion, of course I said yes though! So we’re now engaged and will be getting married the summer of 2011 in Italy! The descent was just as amazing as reaching the summit itself, as we were able to take in all details of the mountain we had missed on the way up: from huge crevasses’ to the spectacular views, we could see almost the entire chain of the Bolivian Cordillera Real De Los Andes and Lake Titicaca. But the best thing was to walk down with the sun on our faces knowing that we made it to the summit of such a magnificent mountain. Congratulations! What a great place to propose. Yes that so true! Marco and I know each other inside out after so many years of traveling together. Also it was about time we've been together 8 years now! Congratulations you guys, epic place to get engaged. We are about to cross into Colombia for the last push to the Carribean. Thought we´d check out your site for some tips. 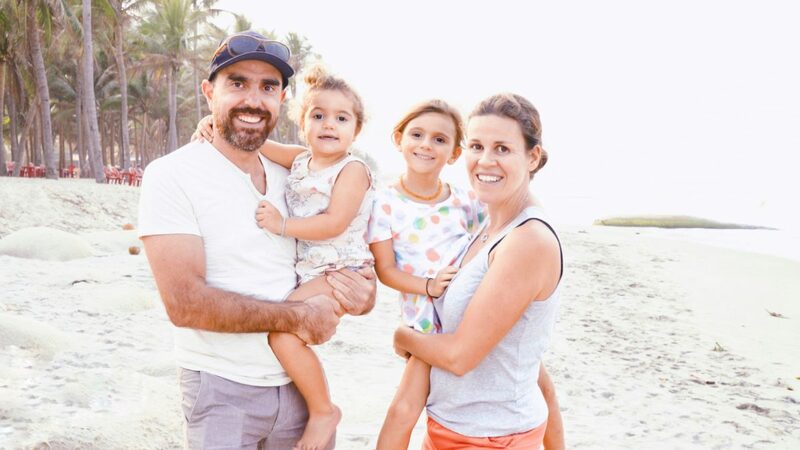 Thanks guys, Colombia was our favourite country in South America, it's so diverse and I'm pretty sure Colombians are the most friendly people on the continent! Let us know if you need any more advice or tips. Wow – how romantic! I guess he figured if you could get through that climb together, you could get through LIFE together! 🙂 Congratulations to you both!! I´m touched, congratulations! This post made me think even harder in trying higher mountains! Nice to meet you! I needed to send you this little note so as to thank you very much over again considering the incredible advice you’ve featured on this page. It is wonderfully open-handed with people like you to present publicly what a number of people would have offered for an electronic book in making some profit for their own end, principally given that you could have done it in the event you decided. The thoughts additionally served as a easy way to realize that other people online have a similar fervor similar to my very own to learn whole lot more when it comes to this problem. I’m sure there are a lot more enjoyable times ahead for individuals that read carefully your blog. What an incredible story and an impressive accomplishment! I climbed Huayna Potosi back in October and needed a break from hiking for a good month. Looks like a cool blog you’ve got, I’ll be sure to read more! What an amazing achievement, congratulations on the engagement too. Were spending some time in the mountains around la paz, illimani beyond one of them, how did you find ‘the stairway to heaven’?